After four days in Athens (read about our Greek adventures here and here in case you missed it), we flew into the Eternal City, Rome. We were to meet my parents there and take our Mediterranean cruise the following day. The very first thing that shocked us was the taxi fare. Coming from Greece where everything is cheap, a 10-min ride for 50 euro seemed to be a little too much! But we were very glad to meet my parents. In the evening, we decided to go out into the city. The hotel ran cheap shuttles to and from the city, so we took it to see Rome. Driving by the ancient ruins was very exciting! We arrived near the Altare della Patria (Altar of the Fatherland), or the National Monument to Victor Emmanuel II, which is also known as "the wedding cake" due to its dominating size and pompous and un-matching architecture. Not unmatched, but un-matching, as in not fitting the Medieval neighborhood. We walked among thousands of tourists, took pictures, and had wonderful Italian pizza. It has very thin crust and white sauce, which makes it deliciously different from pizza that we are used to. Ancient buildings several feet below the current street levels (due to time and numerous floods that would bring dirt to the roads) were breathtaking and made me really understand why Rome is called the Eternal City. During the first night in Rome we visited the Trevi Fountain, which is truly breathtaking. According to the legend, those who throw a coin into the fountain will surely return to Rome. Two coins guarantee that you will meet your love in Rome, and three that you will not only fall in love, but also stay in Rome forever. We stopped at one coin. 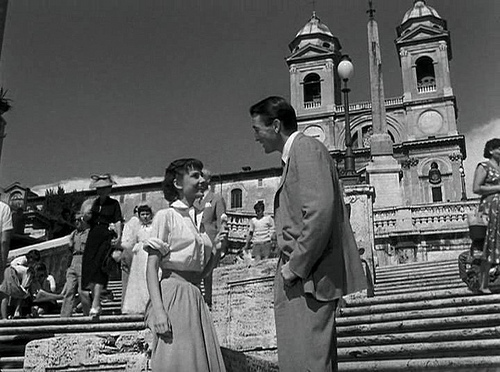 We also stopped by the famous Spanish Steps (which were built by the French and have nothing to do with Spain, by the way), and took a picture where Audrey Hepburn had ice cream in the 1953 film Roman Holiday. We were completely in love with Rome by the time we decided to head back to the hotel around 10:30 pm. We went to the bus stop, which was by the very pretty old building, and found lots and lots of people waiting for the same bus. The next bus would be leaving in an hour, so everyone was trying to make it on this one. When the bus came, all hell broke loose. People ran to the door, pushing each other. I once again felt like I was in Russia. I managed to squeeze in pretty early on and saved three more seats for my husband and parents. I felt so smart! But only a couple of minutes later the driver announced that no one is allowed to save seats and that not everyone will make it to the bus. I started panicking. By this time, my parents were on the bus, but my husband was not. The driver said that only four more people would get on. I almost started crying and ran to the exit, loudly saying that I was not to leave my husband alone in Rome at night when I saw him at the door. Praise the Lord! This experience definitely spoiled some of the excitement, but not for too long. We still loved Rome and were looking forward to spending three more days there upon our return from the cruise. That's so stressful! Glad David made it onto the bus. Things like that in travel are really challenging. I am realizing how many things I missed in the day I spent in Rome--now I want to go back! Oh yes, you should! It is wonderful, and you can never get tired or bored.